Each of the past couple of years has made a big impact personally and professionally on stand-up comedian Tig Notaro. And yet, somehow, it’s only April and Notaro’s already shaping up to make an even bigger splash comedically in 2015, with a stand-up special on tap with HBO, a documentary about her remarkable personal journey premiered at Sundance, and now comes Knock Knock, It’s Tig Notaro, which premieres tonight on Showtime after previously making its theatrical debut last month at Austin’s SXSW festival. Knock Knock finds Notaro getting back on track professionally by getting back on the road. For Notaro, that not only means the occasional club or theater date, but also selected shows where she visits homes and backyards of her fans, which as we see in the first minute of Knock Knock‘s 76 minutes, Notaro and her friends have done sporadically over the years. This documentary has been in the offing since early 2013, when Notaro solicited submissions from anyone across America. Dana from East Nashville, Tenn., was one of those picked, although the actual show didn’t quite match the experience promised in Dana’s pitch. And though it’s all crowdsourced, the tour and Notaro’s experience on it now feels much different because her Largo set and increased exposure has given her a truly dedicated fan base. What could surprise her at this point? Perhaps to add an element of surprise, she quickly brings Jon Dore along for the ride — and for driving duties — after her first show in Chicago. Their pairing lends itself to immediate riffing and ribbing a la The Trip documentaries with Steve Coogan and Rob Brydon across the United Kingdom. No Michael Caine duels to be found here, though. This is all North America, touring the South. But Notaro and Dore shine, as their dry and playfully devious dispositions bounce off one another through Indiana down to Tennessee and Notaro’s native Mississippi, into homes and backyards alike. They also fill time for themselves, and for us as viewers, too, by stopping along the road to shop for knick-knacks and cemetery headstones. How’d she pick her route? For this road trip, Notaro picked a series of dates running south from a planned gig in Chicago down to her native state of Mississippi. Weather and Mother Nature plays a role in altering multiple show venues, which had pitched Notaro on the idea of an outdoor summer setting, on the dock of a lake, or outside of a barn. She’s at ease with all of them, and always seemingly in control of the situation — whether it’s a cramped room inside a home, a grandmother who’s hard of hearing, or small kids heckling and threatening to upstage her opening act. Before the credits are finished, we see that even her fellow colleagues in comedy are impressed with the results, as Jeff Garlin and Seth Meyers weigh in during cameos. But this isn’t just a don’t-try-this-at-home kind of road documentary; it’s also a don’t-try-this-in-someone-else’s-home-as-a-comedian-unless-you’re-ready-for-anything-and-everything-to-happen film. 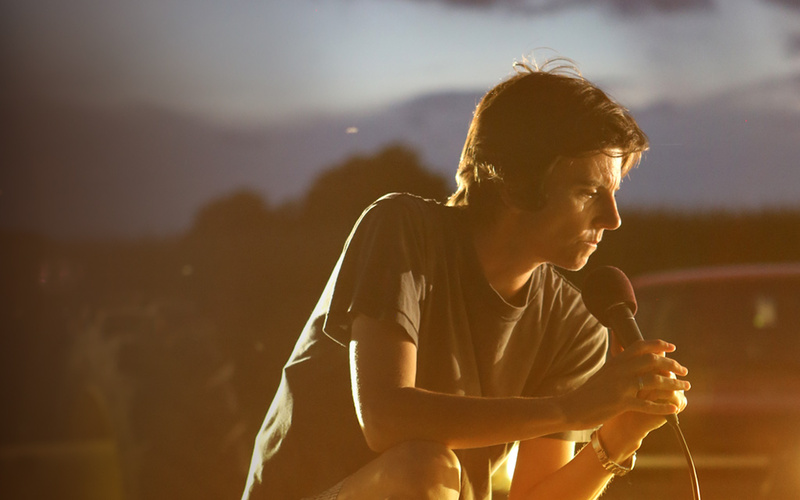 Knock Knock, It’s Tig Notaro premieres at 9 tonight Eastern/Pacific on Showtime, with future rebroadcasts throughout the month on Showtime’s various channels, and On Demand via Showtime Anytime through June 12.